My memories of childhood include Sunday afternoon TV serials such as The Secret Garden, The Silver Sword, David Copperfield, and Great Expectations. Memory plays tricks, but I have a distinct impression that the productions of the 1960s were long enough to be more faithful to the novels than many subsequent shorter versions. Last month’s Great Expectations, spread over three hours, covered aspects of the story that don’t feature at all in shorter films, such as the attack on Mrs Jo, and the characterisation of Orlick. I home in on Orlick because in that recent production I was struck as never before that Orlick is the dark side of Pip. 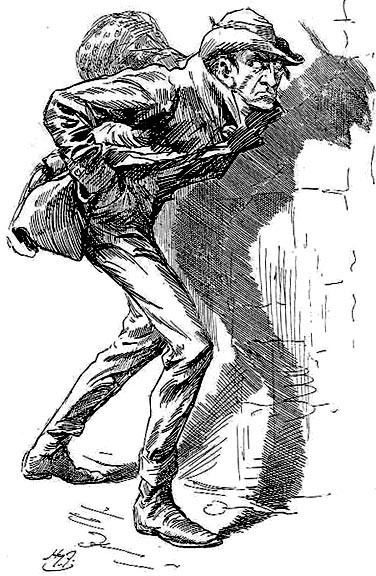 You could regard Great Expectations as an exploration of Pip’s self-deception, of the way in which he falls victim to the attraction of money, status, the high life—seduced by glamour in fact—but all the time this dark character haunting him and reminding him of his past. There may be people around who are permanently sunny, unsullied by dark corners, people who are entirely pure and without stain. As I say, there may be—though I’ve never knowingly met one. And I’m certain that I’m not one. My dark side is alive. Like Orlick, he sometimes disappears from view and I kid myself that he’s gone. But he hasn’t: he struts back into the picture at inappropriate moments. I hear people pray for all stress to be removed from their lives. The hymn Dear Lord and father of mankind, which people seem to like, but I don’t (it’s the tune they like), has that fatuous line ‘take from our souls the strain and stress … ’—can you imagine anything more utterly boring? (And while I’m on this rant, the last verse, Breathe through the heats … is silly as well. Do you want to be emasculated?) We need to struggle to confront the darkness within, the demons that are the enemies of our good selves. Life is a struggle, and part of that struggle is to enable light to overcome the darkness—to let the light bleach the hell out of us. Love the hell out of us is perhaps is a more helpful phrase (sadly, not original). Jesus tells us to love our enemies, and there is a great temptation to forget that our most pernicious enemies are not other people, but are actually parts of ourselves, those inner demons that incite us to pride, the lust for power, and insincerity (all Dickens’ villains). The inner demons that prevent us from being fully ourselves. The inner demons that steal our liberty because we become slaves to them, addicted and dependent. This is the spiritual warfare of Paul’s epistles. Spiritual wickedness in high places—not ‘out there’ but ‘in here’. It is a message of John’s epistles. It is what Christianity is about. In Great Expectations Pip’s ‘redemption’ is balanced by Orlick’s unmasking and arrest, and our happiness and fulfilment will begin only when we acknowledge the Orlick within. Deliver us from the evil parts of ourselves. This entry was posted in A great future behind me, Inner kingdom by Rambling Rector. Bookmark the permalink.